As Japan is situated on several fault lines, the Japanese are familiar with earthquakes and tsunami's. However, the earthquake-proof buildings and tsunami walls near the Japanese coastlines couldn't withstand an earthquake and tsunami as powerful as the Tōhoku natural disaster. On Friday 11 March 2011, Japan was struck by a devastating earthquake and tsunami, also known as the Tōhoku earthquake. It is the most powerful known earthquake that has ever hit Japan since earthquakes have been recorded in the modern scientific way for the first time in 1900. The Tōhoku earthquake is also one of the five most powerful earthquakes in the world . The 9.0-magnitude offshore earthquake had an epicenter 72 km east of the coast of the Oshika Peninsula of Tōhoku, Japan and an underwater hypocenter at a depth of approximately 32 km. Minutes after the undersea earthquake struck Japan, huge tsunami waves of up to 23.6 m engulfed the Tōhoku region, destroying numerous cities and towns in its entirety. The higly destructive tsunami waves traveled up to 10 km inland. The earthquake and tsunami led to many thousands of victims, flooding, landslides, building and infrastructure damage, serious nuclear incidents, making it the most expensive natural disaster on record . Prime Minister Naoto Kan called the natural calamity the "toughest and the most difficult crisis for Japan". 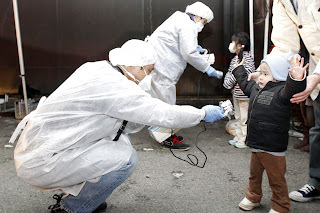 Due to the earthquake and tsunami several of Japan's nuclear plants situated in the affected area were damaged severely. Fukushima I, II, Onogawa Nuclear Power Plant and Tokai nuclear power stations were automatically shut down after the quake . However, the tsunami destroyed the back-up diesel generators of the plants needed to cool down the nuclear core reactor of the plant. In order to stop overheating, possible explosions, further leakage of nuclear material and the risk of nuclear radiation, sea water was taken to the plants for cooling down the reactors. But because sea water could damage the machinery, it was eventually decided that freshwater was needed for the nuclear plants to cool down the reactors. Originally, people living in the area of the nuclear power plants were advised to stay indoors to avoid radiation. Eventually many people from that area needed to be evacuated . Unfortunately, so far the Japanese have not been able to contain the situation in the powerplants. Explosions at a power plant led to radiation and a partial meltdown. Plutonium was found leaking from the Fukushima Daiichi atomic power plant and well as highly radioactive water . According to Sakae Muto, the vice-president of Tokyo Electric Power Co (TEPCO), the level of plutonium is "not at the level that's harmful to human health". Seawater near Fukushima I also contained radioactive material . Greenpeace has also investigated the area surrounding the power plants and based on its radiation measurements the organisation suggests a further extending of the evacuation area surrounding the Fukushima power plant . Japanese people avoid eating fish and foods that originate from the nuclear plants area and surroundings. It is feared that the radioactive material will be hazardous to both human and animal life and that it will contaminate the environment. Radioactive iodine and cesium were found in spinach and milk as well as other food products in the region of the Fukushima nuclear power plants on Saturday. The Japanese government is taking precautions, such as banning shipments of certain produce from Fukushima and neighboring prefectures Ibaraki, Tochigi and Gunma . According to the WHO the radiation of food is a serious problem. Peter Cordingley, a spokesman of the WHO said: "It's a lot more serious than anybody thought in the early days when we thought that this kind of problem can be limited to 20 to 30 kilometers" . He stated that at the moment it is rather difficult to know whether the radioactive material found in some food in Japan originated from the Daiichi power plant . Before the nuclear crisis in Japan there was a large nuclear accident in 1979 at the the USA Three Mile Island Nuclear Generating Station and in 1986 the Chernobyl disaster took place in Ukraine due to major design deficiencies, a lack of safety and the violation of operating procedures . The nuclear catastrophy in Japan raises questions about the possible impact of nuclear energy industry on safety and health. Several European countries have discussed the use of nuclear energy and safety measures or have temporarily shut down nuclear reactors since the Japanese earthquake of 11 March 2011. The European Union is developing a stress test for European nuclear power plants . 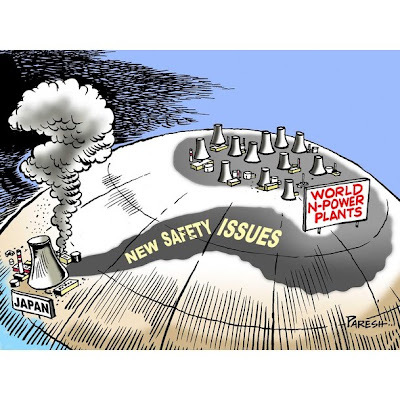 European countries are considering how safe nuclear power stations are but the difference between European countries and Japan - Europe is not as geologically active as Japan - has been taken into account . During a meeting in Brussels with all other European ministers of Environment, Austrian Minister of Environment Nikolaus Berlakovich called for a security check of all european nuclear power plants: "The people in Europe and Austria ask themselves how secure are our reactors in Europe, around Austria [...] It must be quickly proven how earthquake-proof the nuclear power stations are, how do the cooling systems work, what is the reactors' protection. That must come quickly to reassure the people" . Slovak Environment Minister Jozsef Nagy would regard a stress test for all European power plants as a milestone for nuclear energy: "[...] this might be a milestone in nuclear energy, so we will learn and introduce technologies that are resilient to similar, or even stronger, natural events." German Chancellor Angela Merkel announced a safety review of all nuclear reactors and the provisional shut-down of 7 ageing reactors. During this period premiers of German Federations will also discuss renewable energies, international safety standards for nuclear power and what to do with radioactive waste. A survey by German broadcaster ARD made clear that many Germans worry about the safety of nuclear energy. 53 % of the respondents of the survey stressed that all nuclear reactors should be shut down and 70 of the participants of the review is of the opinion that something similar to the nuclear crisis in Japan could happen in Germany . France has a strong nuclear energy programme; it is France's primary source of energy. France derives over 75% of its electricity from nuclear energy - this the highest percentage of nuclear energy use per country in the world. The USA is the largest producer of nuclear power, accounting for more than 30% of worldwide nuclear generation of electricity). The situation in Japan has not left France untouched. Since the partial meltdown at Fukushima French left-wing politicians have begun to doubt the reliance of France on nuclear power as a primary energy source .With regard to fear of a nuclear accident like that which occured in Japan, the French environment minister Nathalie Kosciusko-Morizet stressed that Japan's nuclear crisis occurred in "very exceptional circumstances." She urges Europeans not to over-react to the Japanese nuclear crisis: "We shouldn't, at a European level, fall in the indecency of an over-reaction while the crisis in unveiling" . President of France, Nicolas Sarkozy said that all 58 nuclear reactors on French soil would be tested: "were the tests to be failed or to be unsatisfactory we will take all necessary measures, which simply means shutting them down" . Japan's nuclear crisis has so far evoked many questions and worries about the safety of nuclear energy just like the Chernobyl disaster evoked responses in the 1980s. Physicist Leonid A. Bolshov, director of the Institute for Nuclear Safety and Development, formed in 1988 in the wake of the Chernobyl disaster, stated: “The Japanese disaster will give the whole world a lesson [...] After a disaster, a burst of attention to safety follows” . See 2011 Tōhoku earthquake and tsunami, Wikipedia.org. See Japan Orders Evacuation Near 2nd Nuclear Plant , The New York Times. As quoted from Japan finds plutonium at stricken nuclear plant, Reuters. Japan rejects Greenpeace argument for expanding evacuation zone, Reuters. As quoted from / see Radiation Found in Japanese Food, Foreign Policy Blogs - Global Food Security. As quoted from WHO spokesman: Japan food safety situation "serious", Reuters. Safety of Nuclear Power Reactors, World Nuclear Association (WNA). See Europe split over nuclear safety amid Japan crisis, Reuters. As quoted from Nuclear Power in France, and Nuclear Power in the USA, World Nuclear Association. Europe split over nuclear safety amid Japan crisis, Reuters.